As of 1 January 2019 entrance to Butts Terrace widened providing easier access to the cottage. A lovely mid terrace stone cottage with wood burner in a quiet location. Very close to Bakewell town centre and ideally positioned for visiting the attractions of the Peak District National Park. There is off road parking for a small to medium sized family car to the front of the property, eg VW Golf. Also a beautiful small garden to sit in and enjoy a large glass of wine. We accept short breaks as well as 7 night breaks, but sorry, no pets and no smoking. Please feel free to ring me or use the "Ask Owner a Question" facility for any information and to use a method of direct payment, eg, cheque or bank transfer. We live in West Yorkshire and love Bakewell and our plan is to eventually retire to the area. In the meantime we wanted a holiday cottage we could enjoy as we like to walk and also like cycling. 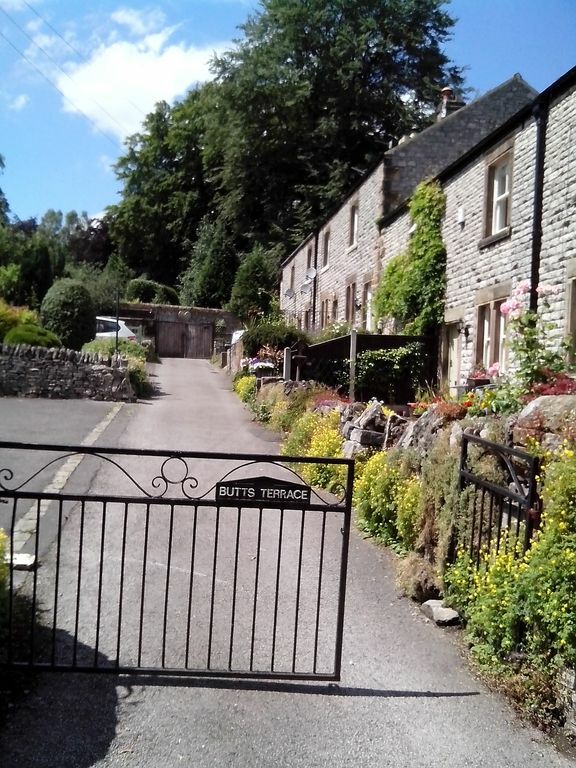 We also enjoy all the facilities that Bakewell has to offer which are within a few minutes walk of Peveril cottage. We spent quite a few months looking for a holiday home and knew Bakewell was ideal. We love the countryside and the town centre has some lovely cafes and restaurants. We are enjoying the many walks in the area and love visiting the surrounding villages. We loved the cottage the minute we saw it and have enjoyed decorating and furnishing it. The cottage is very central to the town centre and yet very quiet. It is set back from the road and in a lovely position. It has off road parking which is opposite the front door. Modern bathroom with bath/shower over, WC and hand basin. A lovely living room with 2 leather two seater sofas, log burner, TV, DVD player. A dining kitchen with table and chairs, electric cooker and hob, microwave, washing machine and fridge. Bakewell Golf Course is just over 1 mile from the property. Notes on accommodation: Sorry no smoking and no pets. Outside: The front of the property is south facing and there is a seating area here. There is also a small garden beyond the parking space, where table and chairs are provided. Towels and linen are included. Other: There is off road parking for a small/medium sized family car in front of the property. Thank you. We hope you visit again. Very characterful, pretty and welcoming cottage. A good-sized kitchen and large comfortable main bedroom. May be a little small for four adults (esp the seating in the living room!). Lovely wood-burning stove. Charming front garden in which you could enjoy a glass of wine. Parking was a little challenging as the turning space is small. Host was extremely helpful with excellent communication. Thoroughly recommended overall - an amazing location from which to explore the beautiful Peak District. Thank you for you kind comments. Pleased you enjoyed your holiday. Only thing I would change is the bathroom door - noisy and didnt really give privacy. Maybe change to a sliding door? It was tricky reversing up to the parking area, but you had warned us of that - would have been impossible with a big car though! Found the recycling of rubbish a bit confusing - bit of guesswork used! Great location - would stay there again! The bathroom door has been replaced and is now quiet and private. There is a recycle instruction sheet in the folder in the cottage. I am pleased you would stay here again. 1 January 2019 entrance into Butts Terrace widened. Lovely little cottage in a great location. The cottage was perfectly located. The parking was a bonus though a little tricky for bigger vehicles. The cottage was well equipped and comfortable. The seating at the front of the house was very pleasantl. Thank you for your kind comments. 1 January 2019 the entrance to Butts Terrace is widened. A lovely small cottage in a great little town. We enjoyed our stay in the cottage, there were 2 of us from Australia & we found the property very well appointed, 4 people may find it a bit small. We spent 10 days there during the July 'heat wave' and enjoyed every minute of our time. It was good having a car parking space, although reversing into the drive was a bit taxing. In the back yard was a clothes line which was very useful. The outside table was used a lot due to the good sunny weather. The property was in a very good location, only a few minutes walk into town, you do not need your car. Bakewell is a great little town, 8 pubs, 6 outdoor shops & 2 supermarkets, plus of course the pudding & tart shops. The Monday market is well worth visiting. We would recommend the cottage & the town. Thank you for your review. Always pleased to hear a visitor has enjoyed their stay. We also love to sit outside the front of the cottage when the sun is shining. 1 January 2019 entrance to Butts Terrace widened..
Cosy clean cottage in a quiet location and only a short walk to the town. Kitchen was well equipped apart from a freezer compartment in the fridge. There is a small bathroom with a powerful shower over the bath and plenty of storage space in the two bedrooms. We thoroughly enjoyed our week stay and did some lovely walking in the area and around Bakewell. Bakewell has some lovely cafes, restaurants and public houses. There are supermarkets, chemists and a small swimming pool. A great position for visiting all parts of the Peak District. It is also only a short walk away to join the Monsal Trail. Booking Notes: We will keep your reservation for 5 days pending receipt of payment. A non refundable deposit of 30% of the total cost is required to confirm the booking; the balance due 8 weeks before the start of the holiday. We reserve the right to cancel the booking if the full payment has not been made in that time. If circumstances beyond our control require us to cancel we will refund all sums paid to us and shall not be under any further liability to you. Changeover Day: Change over day can be flexible. Arrival time is 3 pm. Departure time is 10 am. Notes on prices: 3 nights stay is 75% of weekly price. 4 nights stay is 85% of weekly price. Additional bank charges apply when paying by bank transfer from overseas.